The "Surrealist woman" is lying in the middle of a great bed, sixty feet long, with the rest of the guests seated around each side. Along the bed, as decorations, are a group of dwarfs caught by Harpo. Each is supported on a crystal base, decorated with climbing flowers. The dwarfs stay as still as statues, holding lighted candelabras, and change their positions every few minutes. While love tears at Jimmy's heart, Groucho tries to crack a nut on the bald head of the dwarf in front of him. The dwarf, far from looking surprised, smiles at Groucho in the most amiable way possible. Suddenly in the middle of dinner, thunder and lightning begin inside the room. A squall of wind blows the things over on the table and brings in a whirl of dry leaves, which stick to everything. As Groucho opens his umbrella, it begins to rain slowly. Dalí's first encounter with Harpo Marx was at a party in Paris. They confessed a mutual admiration. 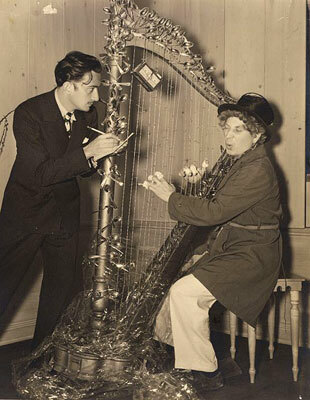 Then Dalí sent Harpo a Christmas present: a harp with barbed wire for strings and spoons for tuning knobs, wrapped in cellophane. Harpo was delighted and sent Dalí a photograph of himself sitting at the harp with bandaged fingers as if he'd been playing it and cutting himself on the wire. He told Dalí he liked his painting The Persistence of Memory (those melting clock faces) and that if he wanted to visit him in California he'd be "happy to be smeared" by him. Dalí did so the following year, claiming, implausibly, that he found Harpo, "naked, crowned with roses, and in the centre of a veritable forest of harps... He was caressing, like a new Leda, a dazzling white swan, and feeding it a statue of the Venus de Milo made of cheese..."
Clearly enchanted, Dalí made two rather beautiful drawings of the comic sitting at his harp, grinning beatifically with a lobster on his head. Makes me feel like gluing thumbtacks onto a computer keyboard -- as an artistic statement against blogging addiction!